Personal injury trauma is often not limited to immediately after an accident or assault occurs; it can be an ongoing experience. Accidents frequently have financial repercussions for the injured, as physical injuries, related illnesses, and mental or emotional distress can affect their ability to earn an income or care for themselves and their dependents. In these situations, as a Wawa area resident who has been injured by the possible negligence of an individual or organization, it is critical that you take steps to receive compensation for your losses. Favourable compensation will enable you to receive needed rehabilitation and to function at the best possible level, given the severity of your injuries. We at Personal Injury Lawyers of Ontario (ILO) understand how overwhelming it can be to deal with personal injury. Our law team is committed to transforming a painful, frustrating, and often emotional process into one of resolution. We consider our clients to be extensions of our family, and we will make every effort to ensure your comfort, ease, and security throughout the litigation process, whether it involves reaching a settlement or bringing a case to court. Car accidents: Motor vehicle accidents account for the majority of reported personal injury claims in Ontario. Related injuries can range from minor to severe to permanently disabling. It is important to consult a legal representative after being injured in a car accident in order to fully understand the potential compensation available to you. Slip and fall: Even the most cautious of individuals can suffer a slip and fall, and the resulting injuries can be life altering. Insurance Disability claims: The process of receiving income replacement due to illness or physical or mental disability can be complicated and lengthy. Insurance companies are often reluctant to give you the full compensation you deserve; they sometimes delay or even refuse a legitimate claim. 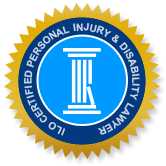 Engaging a personal injury lawyer to negotiate your disability claim relieves you of the stress of this process and generally yields better results. Assault: Individuals who were assaulted by another, including sexual assault, home invasion, bar fights or any other altercation, are often among the most traumatized victims from an emotional standpoint. Recreational and Public Negligence: Schools, parks, arenas or transportation facilities sometimes fail to take due care to prevent visitors or users from being injured. Working with a personal injury lawyer can mean the difference between frustration and financial stress and ultimate resolution. Here, at ILO, our Wawa clients receive the compassion, respect, and expertise they deserve. ILO staff are dedicated to achieving the best possible compensation for you.